Hadar Ahuvia, choreographer, performer, activist, will share an excerpt of her new work The Dances are For Us followed by conversation about the process, ideas, and practices that inform her making. The Dances are For Us will premiere at Danspace Project in New York in May. Showing and conversation—4PM, Sunday, April 21 (yes, it's Easter and the 3rd night of Passover). Co-sponsored by the Hampshire Dance Program and SCDT. The Dances are For Us performs an homage to and a break from a legacy of Zionist cultural workers by rearranging beloved Israeli folk songs and dances to face the Nakba. (Nakba, Arabic for catastrophe, refers to the expulsion and dispossession of the Palestinians in 1948 as a result of the founding of the state of Israel). The work builds on Ahuvia’s several research on the construction Israeliness in early Israeli folk dances based on appropriated indigenous cultures. While returning to the family history and national mythologies surrounding the Jezreel Valley/ Marj Ibn Amer where her great-grandparents settled and where the folk dances emerged, the work is grounded here in the U.S., where the dances are practiced by folklorists, Zionists, Jews and Christians alike. The work proposes a way of breaking the cycles of transmission, appropriation, and theft- across vast plains of ideological manifestations and technological advancements- that have present-day consequences for Palestinians, Israelis and Americans. THEN, SEE HIM PERFORM IN WIP, SUNDAY APRIL 28 AT 4:30PM! CLASS DESCRIPTION AND REGISTRATION HERE! THEN, SEE HER PERFORM IN WIP, SUNDAY APRIL 28 AT 4:30PM! 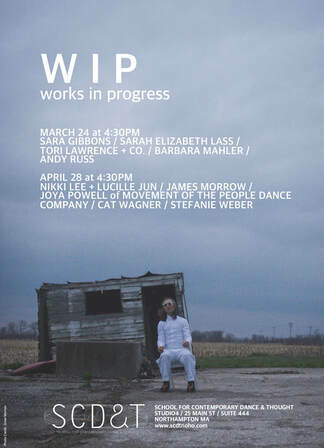 The School for Contemporary Dance and Thought is proud to present WIP (works-in-progress), a performance series that showcases developing movement-based works on Sunday afternoons. WIP values sharing research and experimentation, rather than presenting finished works, and welcomes applications from emerging and established artists. learn more about wip here! Please reserve your spot HERE! These Northampton seasonal Underscores are open to people who already have a firm base in Contact Improvisation, have an interest in improvisation and composition, and will have participated in at least one hour-long Underscore talk-through before the practice. Please read details below. We suggest you reserve a spot. Also, let us know if you are coming to the "talk-through" at 11:00 am with Patrick. It is required for those who haven't done one before and suggested for others to deepen their understanding of the score. ​Chill out, stretch out, cuddle up, watch a dance film. A fiery one woman show with special guests and (joyfully optional) audience participation. I’ve got tricks of the trade, some out-of-the-box shenanigans, dance, music, and serious tirades about WHAT IT TAKES TO SURVIVE WITH LOVE as a human. ​Connecting contemplative and somatic practices with articulate dancing in Northampton, MA. Featuring performances and workshops with Shayla-Vie Jenkins, Paul Matteson, Peter Schmitz, Andrea Olsen, Jennifer Polins, and Scotty Hardwig. Featuring new work by Jen Polins, Jenny Bennett, Joy Davis, and Hatchery members! LEARN MORE ABOUT HATCHERY HERE! 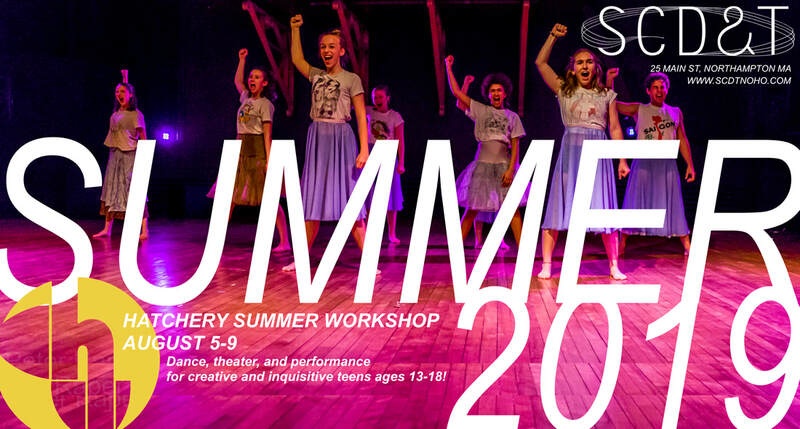 Summer workshop for Hatchery members, teens ages 13-18, and anyone interested in joining Hatchery for Fall 2019. ​Dance training and performance practices including a daily technique class, choreographic mentorship, and new repertory piece created during the workshop. Teachers include Jen Polins, Jenny Bennett, Paul Matteson, and Karinne Keithley Syers.